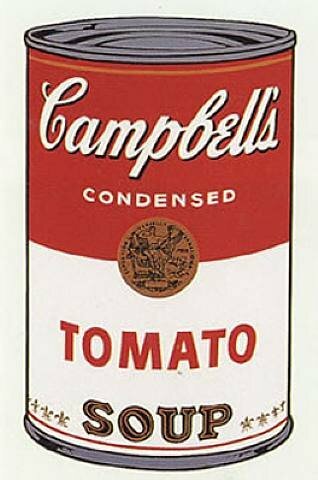 I have always been a fan of Andy Warhol's "Campbell's Soup Can" painting. The subject matter is so simple. It's an every day household item that is very American and everyone can identify with it. Having seen the actual "Campbell's Soup Can" painting at the LACMA museum, I was inspired to create something Warhol-ian, but with a twist. 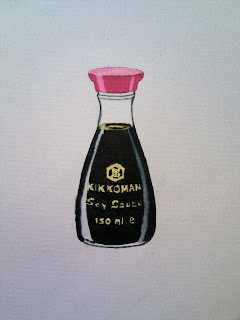 What if Andy Warhol had an Asian American upbringing? What would he have chosen to paint instead of the Campbell's soup can? He probably still would have chosen something simple; something that is an every day household item and recognized instantly my millions just by the shape and color. This would be my mission for a few days, to find that ultimate Asian American item. "I am: Soy". Watercolor on canvas. This is my first ever painting on canvas. I haven't painted since art class in elementary school, but I felt strongly inspired. I went to the art supply store, bought less than $20 worth of materials, experimented with the water colors and began to paint. This took maybe two hours of painting time; one evening if you factor in the time I had to wait for the water colors to dry so they didn't bleed/blend. What have you been inspired to do recently? Strike while the muse is hot! Share your creations with L.A. Graffiti!